This old illustrated card comes with no identifying information on the front or back. It measures 2¾ by 4¼ inches. 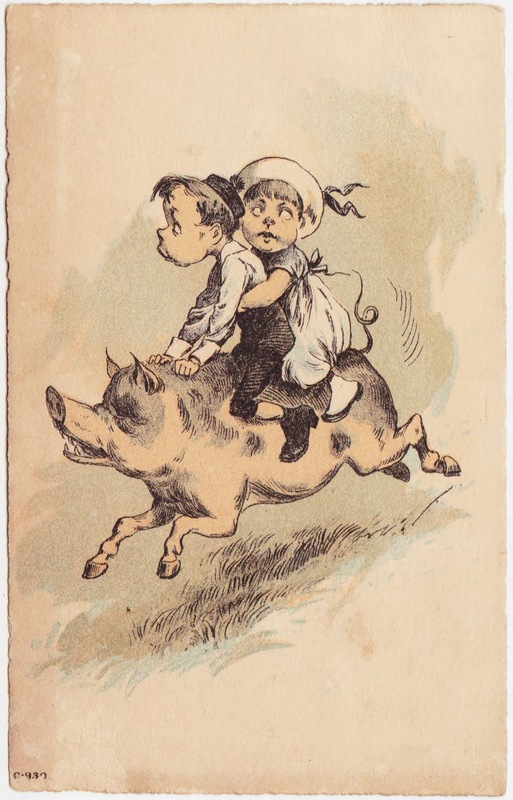 I assume it's a trade card of some sort, but without an additional details, it exists solely as a picture of two kids riding a large pig. That's it. It has no higher purpose. To see some very disturbing vintage food advertising, much of which features pigs, check out this section of the Found in Mom's Basement blog. And don't say you weren't warned. Or if, on the other hand, you're looking for some ephemera that you can actually use on the rainy Saturday night in northeastern United States, here are instructions for making a sock monkey and a sock elephant.